MEGADETH - COUNTDOWN TO EXTINCTION 20TH ANNIVERSARY EDIT. (2CD BOX) | Online Shop | Wizard LTD. Album: "COUNTDOWN TO EXTINCTION 20TH ANNIVERSARY EDIT. 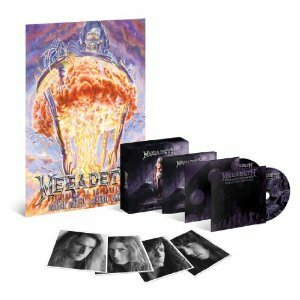 (2CD BOX)"
Megadeth leader Dave Mustaine has personally overseen a new 20th-anniversary edition of the band's most popular album, 1992's double platinum-certified "Countdown To Extinction", which will be released on November 6. Megadeth’s fifth album, "Countdown To Extinction" was recorded in Los Angeles in 1992 as rioting raged across the city in response to the Rodney King trial verdicts. American tensions weren't limited to L.A., by any means, as the "Gulf War" was still fresh in people's minds, the state of the environment was becoming headline news, and President George H.W. Bush was seeking reelection in a heated campaign season. Out of this turmoil, Megadeth was inspired to create "Countdown To Extinction", considered by many to be the band's best and most accessible album. The group's previous albums, including "So Far, So Good...So What!" and "Rust In Peace", included songs that tackled topics like censorship and religious bloodletting in the Middle East. But none were as polemical as the sonic missiles launched by "Countdown". Megadeth laced the songs with acid-tongued commentary about subjects ranging from the futility of war ("Architecture Of Aggression") to the senseless brutality of caged hunting ("Countdown To Extinction"). "Foreclosure Of A Dream" sampled George Bush's infamous "Read My Lips" speech, making a statement about taxation endangering the American Dream. Thanks to a perfect balance of hard-rock song structures, epic choruses, and fleet-fingered guitar work, "Countdown To Extinction" became an instant classic, benefiting from copious MTV and radio play. The album shot to No. 2 on the Billboard chart (it may have hit No. 1, if not for Billy Ray Cyrus' long chart-topping reign with "Some Gave All"), and it was certified double platinum in the U.S. within two years, with sales of more than two million copies.